If you would like to display different tracking numbers by a Google AdWords campaign, you can create custom tracking sources in Call Tracking Metrics aligned to each campaign and associate tracking numbers to those sources. The first step is adding URL tags in Google AdWords for each of the campaigns. 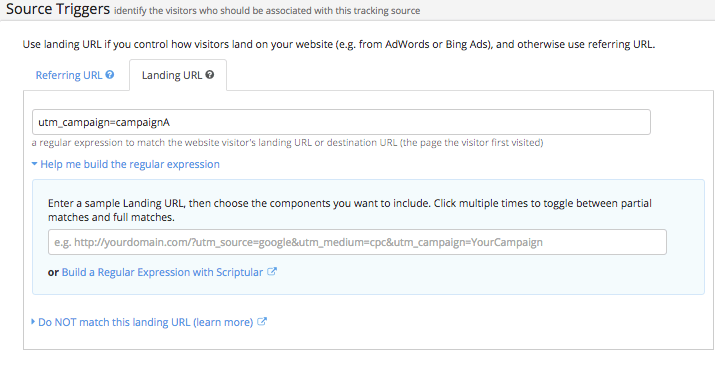 For example, add something to your ad URL like utm_campaign=campaignA. For a second campaign, it could be utm_campaign=campaignB, etc. Click the New Source button in upper-right corner. 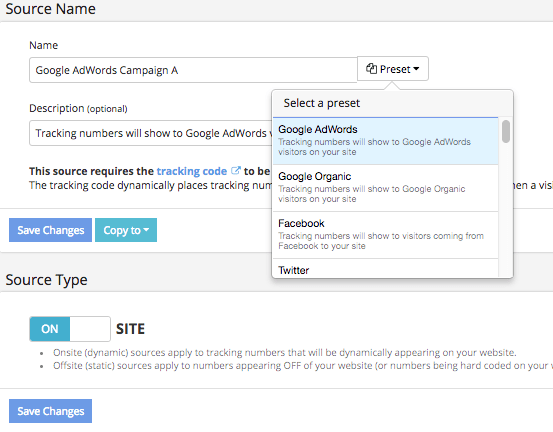 On the tracking source set-up page, choose Google Adwords from the Preset dropdown. Change the Name field from Google AdWords to something unique like Google AdWords Campaign A. Save changes. Create the other sources for the other campaigns using the same steps above. If you already have a tracking number to assign to this custom tracking source, go to Numbers > Tracking numbers > “Edit” and scroll down the Tracking Source. Use the drop down and locate your new custom tracking source and save changes. If you need a new tracking number, go to Numbers > Buy Numbers. After you’ve purchased the number(s), you’ll need to complete the new number set-up by applying your new custom Tracking Source, Call Routing (Receiving Number) and Target Number. When the fields have been completed and saved, your custom Google AdWords tracking source is live and ready to start dynamically swapping numbers.